My name is Jun Salazar. I am 39 years old, and I live with my family in Bawing General Santos City in the Philippines. I was born to a family who are members of the Iglesia ni Cristo Sunday Church. They believe both that Jesus is only human and not God, and that only their group will go to heaven. This group is one of the wealthiest churches here in the Philippines. It has millions of members because their doctrines are very easy to keep. We were not allowed to bring Bibles inside the church and were not allowed to ask the ministers about anything that we found in the Bible that made us confused. Our only obligation was just to sit and listen. I grew up with a lot of vices because the church allows it. I smoked, drank liquor, and used marijuana. The only rule was that the blood of animals was not allowed to enter into our bodies. But everything else was ok.
Because my father is a baker, he taught me how to bake. During my high school life, when my mother died, I stopped going to school and worked as a baker. I only worked because I had to pay for my vices.Because I was young, it was natural to love exploring other places and I applied at a bakery in Falls, Masiag. While I was there, I did not attend our church because it was too far away. There are only two churches near the bakery: a Hope Charismatic church and a Seventh-day Adventist church. I did not bother to find out if either one of them were true because I knew that Iglesia ni Cristo is the only group that can go to heaven. As the years went by, I met a lot of people who came into the bakery. The Seventh-day Adventist pastor Timoteo Piedraverde and his son, Brother Temtem, often came. They were conducting a house-to-house Bible study, and they visited me. But I had a heart of stone and the first time they came I did not want to hear them, even if their message was from the Bible. When I asked them questions, they answered me from the Bible, but when they asked me questions, I could not answer them from the Bible. I noticed that tears were falling from my eyes: I felt shameful for not having a knowledge of the Bible. I did not really understand God’s plan for me, but I decided to worship on the Sabbath and I felt complete. I now know how to open the Bible because the people in the church are teaching me. At first, I felt awkward to take the Bible to church because I never had before. I felt shy and thought that everyone who knew me before would look at me and laugh. But eventually I found that I wasn’t shy to bring the Bible with me. I did not accept baptism for many months. When my family and relatives heard that I was worshiping on Sabbath, they persecuted me. They get very mad at me and when I visit them they argue with me. Because I already knew a little bit about the Bible I was able to answer their questions. As time passed, I eventually became baptized, even though I knew my family would be angry and might disown me. I became an active member of the Seventh-day Adventist church in Falls, Masiag. When my employer noticed that I was always absent on Saturday, she asked me about it. I told her that I have a rest day on Saturday. She did not give me the day off, so I decided to stop working as a baker. By then I knew that the Seventh-day Adventist Church was the true church. They are the remnant people of God who take the true message to the world, so I knew it was my obligation to share the message with others, too. I decided to first share it with my family, but sadly they just argued with me using their own words, not the Word of God. As the years passed, I became a volunteer missionary. When I have money for transportation I go wherever there is a church that needs encouragement, or to support preaching in other places, and to help conduct house-to-house Bible studies. I am amazed that I became a soldier of Jesus Christ because, when I look back into my past, I was a man who was full of vices and prejudices. My wife, who takes care of our two children, is also very supportive of this work. We had a little business that sustained our needs: a mini-grocery store. At 4:00 am we cooked rice cakes to sell to the stores and restaurants. This income helped to support the Lord’s work, for it provided gasoline money for my motorcycle, and also fed my family when I had to leave them for many days. But sadly, a tragedy occurred: our house and store were destroyed in a landslide. We were not able to rescue anything out of the store, but I was thankful to God because my wife and children were safe: that is more important to me. I know this is just a trial that God’s people encounter. Some of our neighbors encouraged me to focus on the business rather than on my work for God. But I said to them that the reward for doing the Lord’s work was eternal life. Matthew said, “Seek ye first the kingdom of God, and all these things shall be added unto you.” Matthew 6:33. As a human, I cannot deny the fact that I have felt discouraged about what happened to us. But according to 1 Corinthians 10:13, “There hath no temptation taken you but such as is common to man; but God is faithful, who will not suffer you to be tempted above that ye are able; but will with the temptation also make a way to escape, that ye may be able to bear it.” So my wife and I still continue cooking rice cakes, but the grocery store is at an end. The author's Bible study students at their baptism. We are trying to build a church in Bawing General Santos City. We have asked churches in other areas to help by contributing funds to purchase materials. There are only three of us trying to build the church and we do it without pay, as long as there is rice to eat. 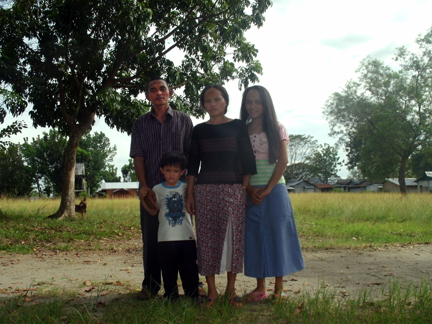 My wife and I decided to build our house in Bawing, near to where the church is being built, so that we can help do the work of the Lord. Because of the loss of our business, we have a lot of debt. My wife asked my permission to go abroad so that she could work and help support the Lord’s work. It was hard but seemed to be the only way we could become stable again. But while my wife was completing the requirements to go abroad, she developed a disease in her pancreas. I believe that it is not God’s will for her to go abroad and I pray to the Lord that He will heal my wife. I also pray that people who have an abundance of blessings can help, even in the smallest way, so that the Lord’s work can continue to go forward and many souls will be ready when Jesus comes again. By Jun Salazar. Support for the work in the Philippines can be sent to Mission Projects International, PO Box 59656, Renton, WA 98058. 03/14/2015: What Does It Take to Stand?